His talent and technical skill destined Roy Paschal’s works to be desired and collected, shown and revered. But his art would never have gotten such solid legs under it, would never have taken him on such lively adventures if he hadn’t said ‘Yes’ to so many overtures. Thinking quickly through his artist’s bag of styles and techniques – and how he could extrapolate those into new ways of making art – cleared him to say ‘Yes’ to caricatures, then forensic facial reconstruction. In time, those skills eased him into archaeology projects and sculpture. Along the way, he said ‘Yes’ to colleagues who wanted him to explore remote natural sites in which to paint, new to him and friends, old to artists who had painted there before. By his second Ringling year, when the finer points of art were taught, he spent many lunch breaks sketching in galleries of the John and Mable Ringling Museum of Art. Riding his bicycle around the neighborhoods, Paschal often ogled clowns practicing their juggling in their driveways or families perfecting trapeze acts in their backyards. Not knowing whether art could suffice as a career, though, Paschal began applying for jobs a few months prior to completing his Ringling studies. “I had the idea I’d like to be a field chemist and was headed to what I thought was South Carolina Wildlife (now South Carolina Department of Natural Resources) to file an application. By mistake, I ended up at SLED (South Carolina Law Enforcement Department). When I realized my mistake, I thought, [Well, I may as well ask. ]” Yes, they did have a lab at SLED, but no vacancies at that time. Paschal left his application anyway. Soon after, when he got a call for an interview, he said he’d be back in Columbia in a few weeks for Spring Break (everyone else was going to Florida; Roy was coming home from Florida.) “I thought about it and decided, yes, I’d better get on up there, not wait until Spring Break to interview for that job.” Offered and accepted. SLED co-workers took note of his doodles and drawings, as well as his caricatures done of for certain individuals’ retirement celebrations. Other Paschal caricatures were framed and, for years, graced the walls at Diane’s before the popular Devine Street restaurant closed. One work day a SLED officer came to Paschal asking if he thought he might be able to do a sketch of an armed robbery suspect. “Yes, I think I can do that,” he said. “They caught the guy, and before long Robert Stewart (who later became Chief Stewart) found budget to send me for FBI training where I learned skull reconstruction, a three-dimensional version of a suspect sketch.” Paschal’s title at SLED was soon upgraded to Lieutenant, and for the remainder of his career there, he worked as a forensic artist; in addition to drawing sketches of suspects, he helped set up a state-level program to benefit the long reach of law enforcement. Fine art ran parallel to the practical art Paschal practiced in his job. 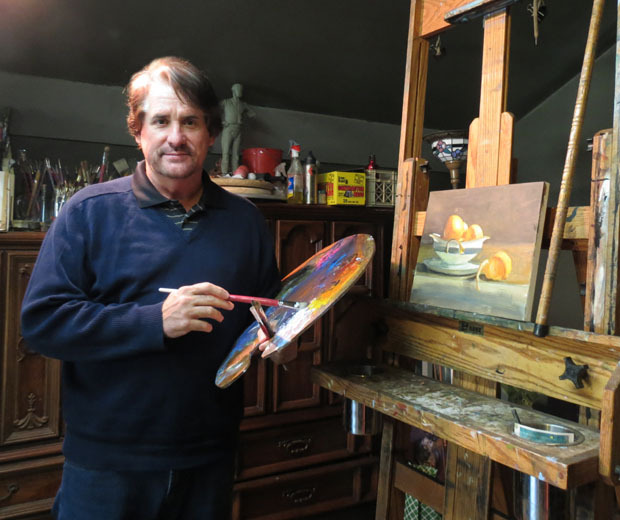 When his talent was recognized with a top State Fair prize, he already had been painting for a number of years with About Face, an affiliate of the Columbia Museum of Art. About Face members meet regularly for portrait and figure work; from a sprawling space below the museum’s gallery levels, they draw from life – meaning, with live models. Their output and concerted contributions bolster the community’s art backbone and provide its members a source of staunch friendships and unswerving support. One Saturday a month, “Paint Out,” an About Face splinter group paints off-site at a pre-scouted location - in plein air, in the time-honored tradition. “Paint Out gets me out into nature, into a different environment, and closer to some very good friends,” Paschal said. Later, Paschal created a mold from which he has cast two sets; the South Carolina State Museum purchased a pair, and the Boston Museum just held over a popular exhibit in which the other pair is on view. Whether on an archaeological site or in a Carolina eddy or meadow, Paschal revels in foraging in nature and, in About Face, found three others who shared his penchant. So that he and the rest of loose-knit team – comprised of painters David Phillips, Jim Finch and sculptor Kris Merschat - could make the first foray of what quickly became a greatly-anticipated tradition, he said Yes, he would get the necessary permits, maps and charts as well as directions and some of the provisions. The artists first chose one of South Carolina’s barrier islands, set up camp for several days of gourmet meals cooked on a two-burner Coleman stove, and committed to painting a couple of landscape paintings each day. Those adventures, to Capers, Edisto and Hunting islands as well as the Georgetown Lighthouse, have sourced many stories about time and weather surprises – and some “keeper” pieces of art. Following his post-retirement Grand Tour of Europe’s art cities, Paschal spoke so glowingly about what he experienced on the continent that his About Face buddies begged him to lead the way back. This time his Yes played out in a rented villa from which a cadre of artists – who by then had named themselves the Van Go-Goghs – ventured forth each day, retracing and painting where Van Gogh had painted. “I went ahead of the group by several days to check everything out, get the rental cars lined up and plot our itinerary. We spent nearly two weeks painting in Provence locations we knew, from history, Van Gogh had set up his easel,” Paschal said. Most recently Paschal traveled solo to remote Cabaya Isle, a small fishing village in Costa Rica where children from the nearby huts clamored around him after he finished dinner in a small family restaurant. “They wanted me to draw their pictures.” You can guess by now what Paschal said.